Personalia: The President returned from Bangalore on 5th May. She is keeping well at the headquarters. 112 students of Sister Nivedita Girls’ School appeared at the Madhyamik Examination 2014. All passed in first division with excellent results. 104 secured Stars, 29 obtained AA grade, while 68 got A+ grade and 7 secured A grade. 29 students of our Khonsa school appeared at the AISSE, 2014 (Class X). All passed in 1st Division with high marks, 28 obtaining Stars, 20 securing AA grade (90% marks and above), while 8 students got A+ grade (80% and above). 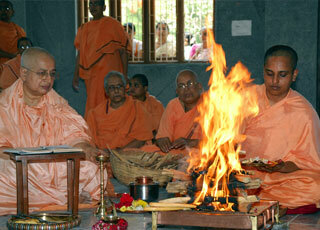 Temple Consecration Ceremony at Sri Sarada Math, Bangalore, Akshay Tritiya – 2nd May, 2014. 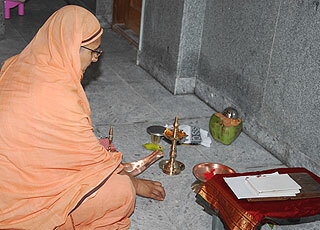 On 1st May, there was Ganapati Puja and Vastu Homa. 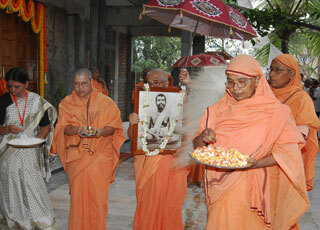 On Friday, 2nd May, after the parikrama of the shrine and natmandir, at 7 a.m. Rev. 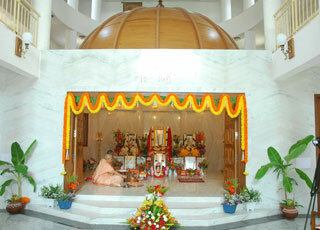 Pravrajika Bhaktiprana Mataji, President, Sri Sarada Math and Ramakrishna Sarada Mission offered arghya to Sri Ramakrishna, Holy Mother and Swami Vivekananda, performed arati and dedicated the temple to the Holy Trio. 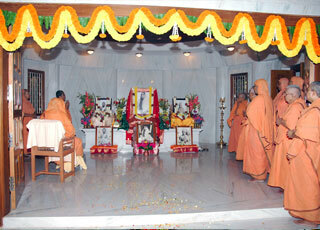 At 7.30 a.m., there was special puja, chandipath, bhajans and homa. 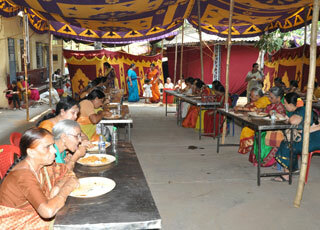 Prasad was distributed among 2300 devotees. 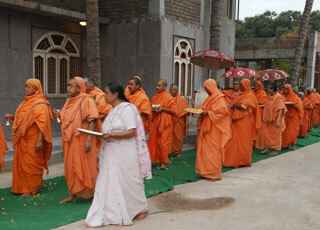 In the afternoon, there was Ramnam Sankirtan. 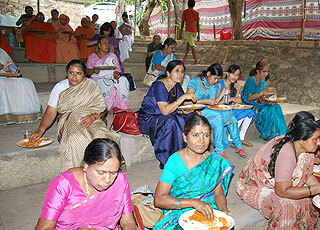 On Saturday, 3rd May, from 7 a.m. to 9 a.m., there was chandipath etc. 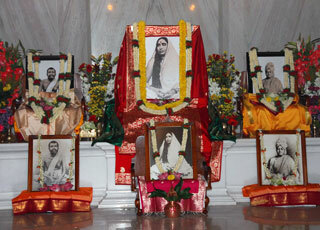 by lady devotees. 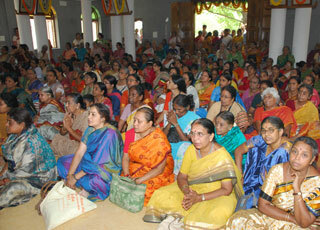 At 4.30 p.m. there was the public meeting. Rev. 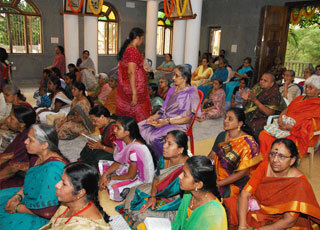 President Mataji delivered her Benedictory Address, after which Pravrajika Ajayaprana, President of the Thrissur Math spoke on the importance of the occasion, while Pravrajika Amalaprana, General Secretary, Sri Sarada Math and Ramakrishna Sarada Mission, delivered an inspiring speech. 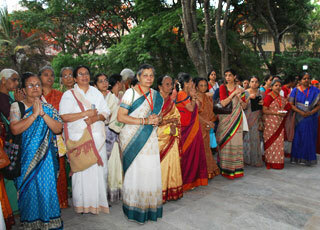 At 7 p.m. there was a cultural programme of Bharatnatyam. 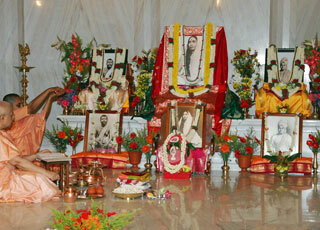 On Sunday, 4th May, Sri Shankaracharya Jayanti, Rev. 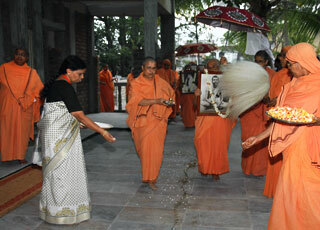 President Mataji gave mantra-diksha to 27 aspirants. At 10.30 a.m., Pravrajika Bhavaniprana, President of the Guntur centre and Pravrajika Adityaprana of Bangalore centre spoke on Sri Shankara’s life. In the evening there was a seminar on Universal Religion, when Pravrajika Ajayaprana, Pravrajika Amalaprana, Pravrajika Prabuddhaprana, and other eminent speakers and scholars explored the subject from different angles. 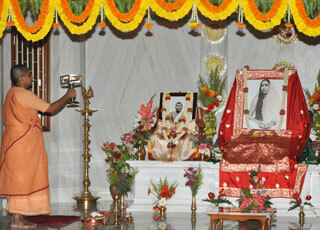 At 7 p.m., there was a programme of Kathak dance drama. 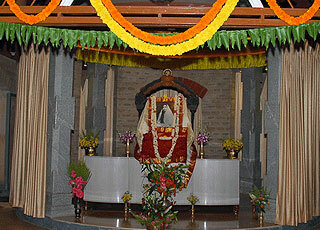 On 5th and 6th May, as a part of the function, a trip was arranged for the delegates and the monastic guests to Sri Chamundeswari at Mysore and other places of interest, including Sringeri Sri Sarada Peeth and Sri Sarada Math, Chikmagalur. 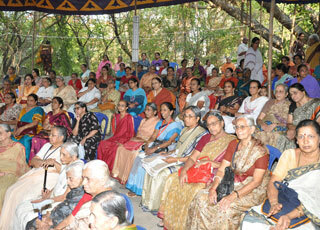 In all, 52 delegates from different parts of India and 44 monastic members attended the function. If you want peace of mind, do not find fault with others. Rather learn to see your own faults. Make the whole world your own. No one is a stranger, my child; this is your own.